The older Ballymena United youth sides caught the eye at the weekend, with both the 16s and under 17s winning in the National league cup. A weakened under 13s were not so lucky, exiting the NIBFA cup to Greenisland in freezing conditions at Newtownabbey. The under 14s faced similar dreadful weather at the Showgrounds and lost out to Lisburn Rangers on extra time as both teams tired in the conditions. The 15s fell to an impressive Larne Youth side while the under 11s had another high scoring win in Lisburn.The 12s drew with Shankill in another tight game. BUYA 0, Shankill 0: Closest to opening the scoring in the first half was Billy Ewart whose rising effort was saved by the Shankill keeper. Right at the end Ben Dallas crossed dangerously but Joshua Balmer couldn’t stretch to get a decisive touch. Greenisland 7, BUYA 3: Unfortunately United were missing a few key players on the day for their cup tie but put on a spirited display in a highly entertaining game. Falling behind to controversial opener the sky blues battled away in the freezing rain, and Blake Douglas scored a stunning effort,driving at the Greenisland defence before rifling home from 20 yards. A further towering header from Sean OCallaghan at a corner got United back into the game but the flowing east Antrim side impressed themselves and pushed on once more with two efforts.United were down to 10 men for periods but there was one further high spot with a rasping Taylor Adger drive before two late Greenisland efforts. BUYA 2, Lisburn Rangers 4: Grim conditions at the Showgrounds as both sides battled in the freezing rain. United desperately conceded a late equaliser in injury time. Into extra time and Lisburn coped with the conditions better with two late efforts. 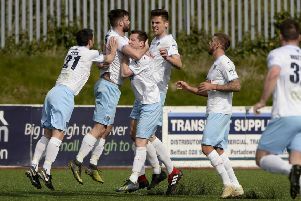 Ballymena United 1, St Oliver Plunkett 0: New signing Lorenzo Dawkins made no mistake from the spot on his debut as Sky Blues progressed to the 3rd round of the League Cup. A game between two evenly matched teams was played in front of a good crowd of spectarors despite the poor weather.The Ballymena boys played some great passing football and pressed Plunketts throughout the first half. The best of the chances coming from the front pairing of Smyth and McKeown. Following the introduction of Little another debutant from local boys Carniny, Ballymena picked up the pace and but the Belfast outfit under pressure but never really looked like finding that much deserved goal. Extra time loomed and yet again the boys never gave up. Shortly into the second period Galloway whipped in a free kick which found a Plunkett player with his hand up leaving the ref with no option up to award a penalty. Dawkins stepped up and rifled the ball deep into the back of the net. Cookstown 1, Ballymena United 2: Ballymena u17s are through to the quarter finals of the league cup thanks to hard fought 2-1 win away to Cookstown.Ballymena started the brighter and had chances through Jack Walshe and Luke Stockman. Cookstown hit the crossbar before they took the lead with a shot from distance. Sam Armstrong had a strong penalty claim turned down. Ballymena were playing some excellent football in the second half but couldnt find that equaliser with Rhys Smith and Sam Armstrong going close. Ballymena leveled when Phil Maybin squared the ball for Sam Armstrong. Ballymena were putting on the pressure and went ahead through Philip Maybin. Calum McCabe made a great double save to keep Ballymena ahead.